Hey Melbourne, how great is this weather? Let's hope it sticks around for next weekend. We're taking part in a garage sale hosted by Arthur's Circus, aka our awesome landlords and downstairs neighbours here at Simply Phoebe hq. In addition to vintagey goodness from Arthur's Circus, there'll be lots of clothes, books, furniture, ephemera, toys and other stuff up for grabs. I'll also be using the opportunity to sell some older Simply Phoebe stock at bargain prices, and maybe show off a few new summer pieces. The North Melbourne Market is also on next Sunday, so it's a great day to get out and about in our awesome little 'hood. While you're here, we thoroughly recommend sampling the mac 'n' cheese whilst browsing the vinyl at Wooly Bully, followed by a sweet treat at the delightful Beatrix. Seriously, North Melbourne is where it's at. 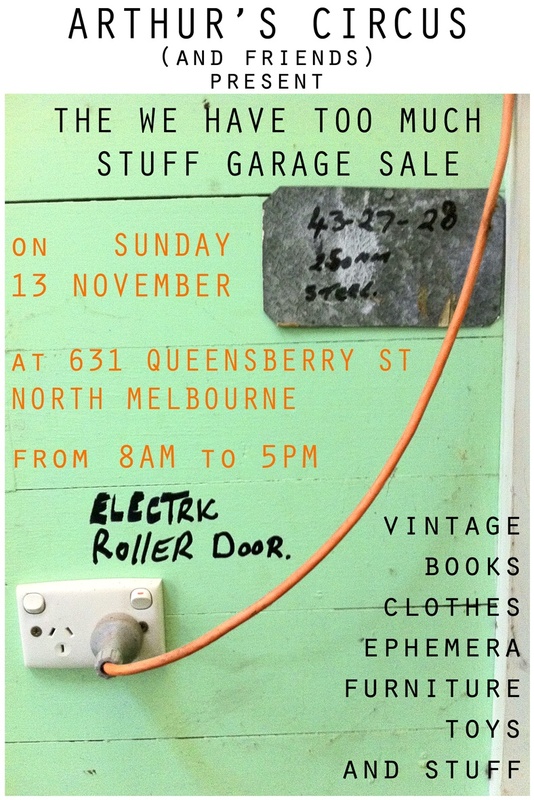 So come on down to 631 Queensberry St, North Melbourne (between Curzon and Abbotsford Sts, just two blocks down from Errol St), next Sunday 13th November, from 8am to 5pm.